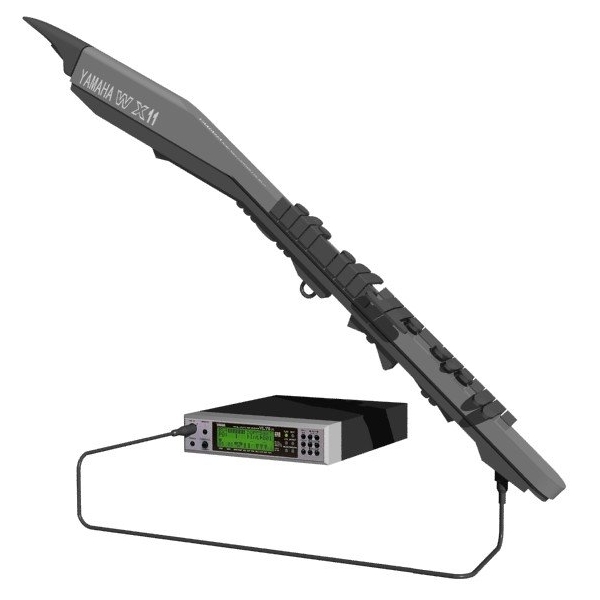 Yamaha is one of the few manufacturers who have remained committed to the development of MIDI wind-controllers. In 1989 the WX7 was introduced and in 1993 the WX11. 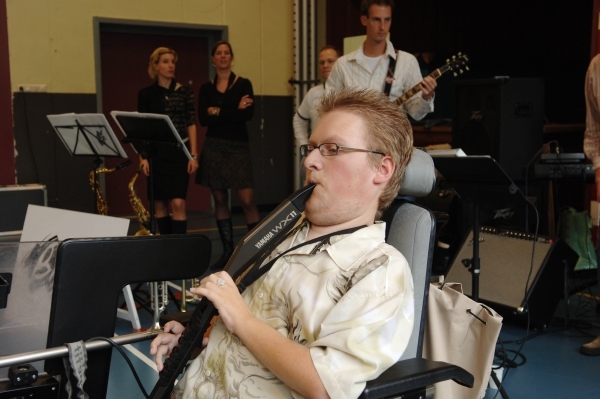 Alex Hanssen, music therapist at the Rehabilitation Centre “Groot Klimmendaal” in Arnhem (Netherlands), was the first to use the Yamaha WX11 in his musical therapy sessions. In 1999 the WX11 model was followed up by the WX5. Both have proven themselves to be very accessible instruments for disabled people. Having worked for many years with both of these wind instruments we have come to the conclusion that there is a big difference between them. A lot of disabled players can only use one hand. With one hand you can only play four notes from the Cmaj scale on the WX11. However, on the WX5 you can play the whole octave of Gmaj with only one hand! For participants with only the use of one hand, this means that the musical range is much wider using the WX5 compared to the WX11. I refer you to our download pages – there you will find an ever-growing collection of sheet music. The WX11 is ideal for participants with enough body strength to use both arms. Often it is not even necessary to place the instrument on a microphone stand (as one-handed players do) – the player can hold the instrument between both knees or use a simple neck strap. Another advantage of the WX11 is its ergonomic design – there is as bend in the instrument above the keys. This helps to keep the instument close to the body. Unfortunately, this bend is not present on the WX5 which succeeded it. However, with some minor adaptations the WX5 can become very playable for many musicians. Both WX11 and WX5 perform best when connected to either of the two modules specially developed by Yamaha for the WX family. If you use one of these modules then you won’t need an external power supply for the instrument. Wich brings us to one final difference between the two instruments: The WX5 has a true MIDI out, the WX11 has no MIDI output built in – if you want to connect the WX11 to a synthesizer other than those described below, you need a special MIDI connection box. There are two available: the Yamaha BT7 and the WW-Bat by the firm “Wind Works Design”. The sounds modules which suit the WX11 and WX5 particularly well are the WT11 and the VL70m. The Yamaha WT11 came first – it was then succeeded by the flagship, the Yamaha VL70m. The VL70m has a very special method of sound generation called ‘Physical Modelling’. The Yamaha VL1 was a precursor, being the first application of Physical Modeling in synthesizers. The Yamaha VL70m sound module is the little brother of this famous synthesizer. Physical Modelling is a way of generating sound by imitating the physics of real instruments as closely as possible. The sound itself is not simulated (unlike in a wavetable synthesiser) but the interaction between all the elements of a physical instrument and the air passing through it are simulated using a mathematical model. The advantage of Physical Modeling is that a wide range of sound parameters can be brought into play. An example is a flute – ie: the purity of the tone depends on the strength of the blow. By gently blowing, the flute will only produce a gentle whistle sound. A medium blow will give a normal tone, and a hard blow will add more wind-noise and harmonics. The MIDI wind-controllers transmit Breath Controller (cc#2) messages in response to how hard you blow. It samples your breath pressure regularly, many times per second, converting it to a value between 1 and 127. If you blow softly then you get a low value. The harder you blow, the higher the value. The VL70m listens to the “breath control” messages coming out of the WX5 or WX11 continuously. You can vary this value within a single note. Think of it as a volume pedal, or a car accellerator pedal, but instead of your foot you use your breath to vary the intensity of the tone. Because of the way Physical Modelling works, it is not just the volume which changes, but (as described in the flute example above) the whole tone of the note can change, just like the tone of an engine when you press the accellerator pedal.